This post is part of the One of My All-Time Favorite Cartoons Blogathon, hosted by Steve at Movie Movie Blog Blog. Read the other posts in this event HERE! Years ago there was a huge Warner Bros. Studio store in midtown Manhattan. GAWD, I loved that place. It was like a temple to my childhood. I was always seeking excuses to go over there. Christmas shopping–yes! Someone sick in the hospital–yes! No particular reason except I loved being there and riding up and down the escalators seeking out obscure Warner Bros. characters from far above–YES! 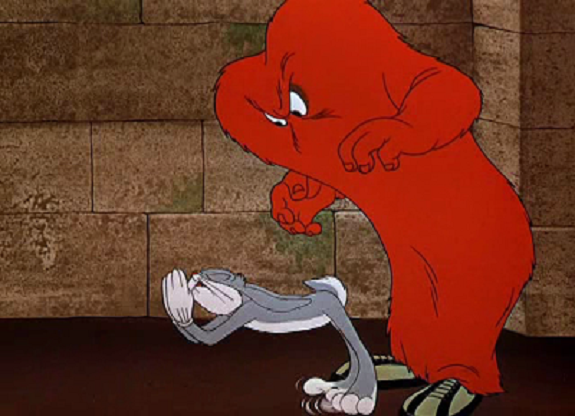 One of my very favorite Warner Bros. characters was Gossamer, the hairy, orange monster in white tennis shoes who terrorizes (hah) Bugs Bunny in Hair-Raising Hare (1946) and Water, Water Every Hare (1952). Oh, how happy I was whenever I found a Gossamer item at the Warner Bros. store. The weird thing about these two cartoon appearances by Gossamer is that they are nearly identical in plot and situation. Bugs Bunny finds himself in the castle of an Evil Scientist (BOO), one who resembles Peter Lorre in Hair-Raising Hare, and one who sounds an awful lot like Boris Karloff in Water, Water Every Hare. In the first cartoon, Bugs is meant as a meal for Gossamer (who is actually unnamed until his reappearance in the 1980 cartoon Duck Dodgers and the Return of the 24 1/2 Century). In the second, Evil Scientist wants Bugs’ brain for his robot creation, promising Gossamer a spider goulash as a reward. Even some of the jokes are the same. Probably the most iconic are the ones where Bugs gives him a manicure in the first one, and a “perman-a-ment” in the second one, both ending disastrously for Gossamer. Bugs goes into a routine as a manicurist/hairdresser who finds monsters the “most IN-ter-resting” customers. What endeared me to Gossamer from the beginning was the way he falls for the ruse, because clearly, being a big, hairy, orange thing can give a monster a bit of an inferiority complex. The way he looks at himself in the mirror, admiring how Bugs is styling his hair, handing him bobby pins, makes me totally love him. I feel bad for him when he ends up with his fingers caught in mouse traps or his hair exploded off his head. It’s not easy being orange. In superb trickster fashion, Bugs easily defeats Gossamer several times, but unlike other Bugs cartoons, I don’t find myself cheering his successes. I think it’s because unlike most of Bugs’ other enemies, Gossamer doesn’t see himself as better than Bugs. He’s just a minion doing his master’s bidding. Maybe it’s better that Gossamer had only two appearances during the golden age of the Warner Bros. cartoons. He’s made several in more recent years, but that doesn’t compare to these two cartoons. It just makes him that much more special. Debbie November 1, 2015 November 28, 2015 Animation, blogathon, Bugs Bunny, cartoons, Gossamer, Warner Bros. I loved those cartoons, and remember them both. I was queued into Chuck Jones when I wrote one of my short stories last year. It’s amazing where inspiration comes from. That’s so cool–I love how that was your inspiration for a story! I had this image of Bugs dressed like a witch to fool Brunhilda the whole time I was writing it. The story isn’t like that, but the style bled through. Nice tribute to Gossamer. I did always like that expression on his face when Bugs was putting up his “hair” in bobby pins. And I definitely had a similar affection for the Warner Bros. Store. Thanks! I miss that store so much. Even in though I do most of my shopping over the internet these days, if it still existed, I would still be looking for excuses to wander through it. Great post Debbie. 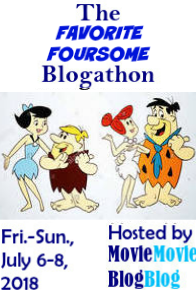 I was going to do this blogathon, but I’ve never been a fan of cartoons nor have I really seen them. I did enjoy your post however. 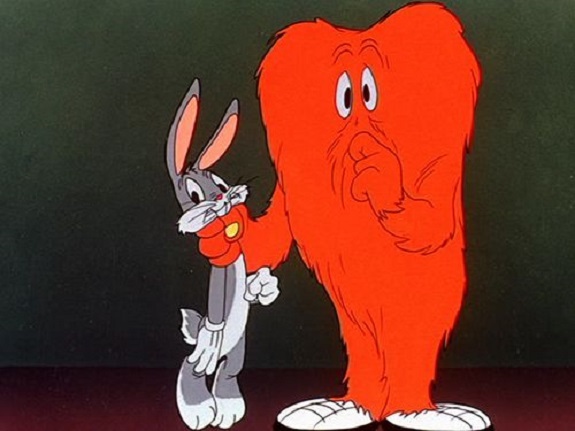 I love that scene where Bugs styles Gossamer’s hair, and the big orange lug is so proud. Wonderful post. I might have these on DVD, and I’m going to watch them again this weekend.